Ducks are some of the most widespread, popular and familiar birds, but they are also some of the most difficult to attract to even the most bird-friendly backyard. Birders who understand ducks' unique needs, however, can still take steps to attract these wonderful waterfowl with some success. While there are many duck species all around the world, these birds have very specific habitat needs that are not typically met in a backyard. Ducks require a relatively large individual range, and most duck species need large amounts of water in the form of marshes, lakes, or rivers that backyards cannot generally provide. When a birder's backyard is adjacent to a nearby duck-friendly wild habitat, however, it is easier to attract visiting ducks to the yard. No matter how ideal a backyard may be, only a few duck species are comfortable enough close to human habitation to visit. Mallards and wood ducks can be likely backyard guests, and muscovy ducks will also occasionally visit yards where escaped or farm birds are present, as will black-bellied whistling-ducks and bar-headed geese in the proper range. Backyard birders may also be visited by a wide range of hybrid ducks or escaped domestic ducks that are accustomed to living near people. As with any bird, a backyard must meet ducks' survival needs for adequate food, water, shelter, and nesting sites before the birds will become regular guests. Food: Ducks are omnivorous and with their hearty appetites will sample a wide range of different foods. Ground-feeding areas or large, low platforms may be suitable for ducks, and they will readily feed on cracked corn, spilled birdseed, and kitchen scraps including vegetable trimmings, oats, and wheat. Planting berry bushes can also help attract ducks, and using mulch in garden areas will give these waterfowl ideal foraging areas for earthworms and insects. Water: Ducks require significantly more water than more common backyard birds, and while a small ground bird bath may be suitable for a drink, larger ponds are best for attracting ducks. A pond can include a fountain or waterfall for the splashing sounds that will help attract birds, and different depths—from shallow shelves to deeper diving holes—will appeal to more duck species and provide a better overall habitat. For the best results, the pond should also include aquatic plants such as reeds and lilies, and a half-submerged log or overhanging rocky shelves can also give the pond a more realistic, natural touch to encourage ducks to visit. Shelter: Ducks can be nervous when they are out of the water, and tall marsh grasses planted around the edge of a pond will help them feel secure. A brush pile can provide additional shelter for ducks, and they will use shrubby cover as necessary to stay protected. Nesting Sites: Ducks will nest in a variety of places, from ground nests in concealed grassy areas close to a pond to brush piles that may be quite some distance from the nearest water source. Providing duck boxes can help attract nesting ducks, and ducks may even use planters or flower boxes as impromptu nesting sites. Some ducks are cavity-nesters and will use large, hollow snags for nesting. Even when deliberately planning to meet ducks' needs in the backyard, it can be challenging to attract these waterfowl. If your yard is duck-friendly and ducks are common in nearby parks, reservoirs or refuges, these extra tricks can help bring them to your backyard. Keep pets away from backyard ponds and take steps to discourage feral cats and other predators that can prey on ducks and ducklings. Minimize or eliminate insecticide and herbicide use that reduces food sources ducks rely on, both in the yard and in a backyard pond. Add lifelike duck decoys to a backyard pond to catch the attention of passing ducks so they will investigate a new habitat patch. As an alternative to hosting wild ducks in the backyard, it can be rewarding for backyard birders to adopt rescued pet ducks or unwanted surplus ducks from local farms. 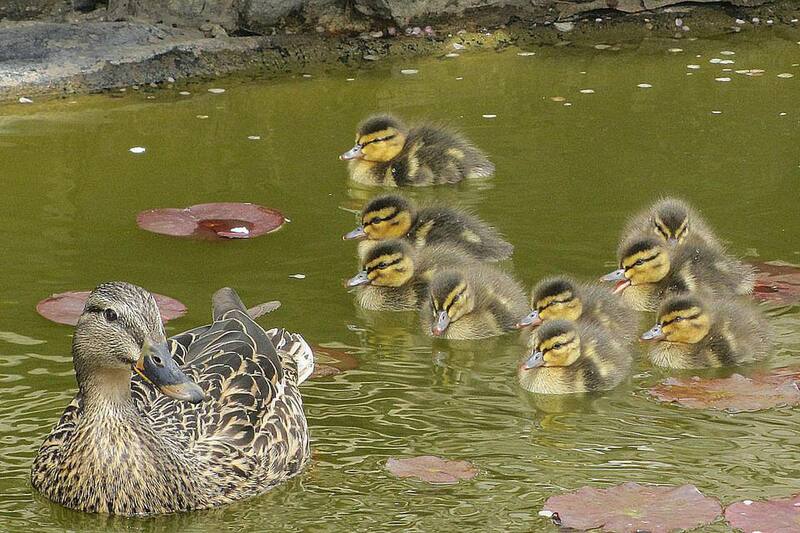 Many Easter ducklings are abandoned in local parks or surrendered to rescue centers when they outgrow their fluffy duckling stage, and these birds can be loyal and attentive pets that adapt very well to backyards and can provide years of faithful companionship. The presence of pet ducks can also attract the attention of wild ducks, and soon both pets and wild visitors may be enjoying a duck-friendly backyard.